KIND’s outreach project, The Voices That Matter Most, empowers immigrant and refugee youth to conduct public education and advocacy on behalf of the thousands of vulnerable young people fleeing violence in their home countries in search of protection and a chance at a better future in the United States. 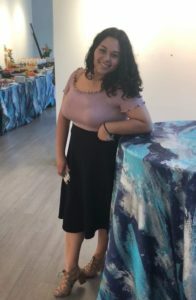 This is what she has been up to since then, and what she wishes to share about what she’s learned from KIND, advocacy, and publicly sharing her story. Hi Katya! Thanks for joining us. I’d like to first start off by asking you about school. I know your school year is soon coming to a close, so could you tell us a bit about how your school year went? Any interesting activities you were involved in? This school year has been challenging. Getting close to 12th grade is not easy, but with the support of the teachers, I have handled work and tests. I have been involved in a group which we call “Language Coaching”, founded by my classmate, Orlin. He had the idea to teach English to 9th-grade newcomers that have low English skills and assigned them a partner. In school, we have A days and B days, 11 graders have 27 minutes of mastery time and during that time on B days we meet with our partners. Working with my partner Katerin has been amazing, I’ve seen how much we can impact people’s lives in such little time. Since your participation in the 2017 KIND Gala, have you been involved in other public speaking events or activities? What did the experience teach you about advocacy and sharing your story? Did this experience motivate you to become more involved? I’ve been involved in many events since the 2017 KIND Gala, and sharing my story has been one of the best things I have ever done. People see who I really am and what I have done to show how proud I am of where I come from. This inspired me to raise my voice, to tell our stories and motivate others to feel proud of who they have become and to not let others decide to change our true purposes in this country. On May 2nd, a group called “Teach for America” (TFA) came to our school and the coaches of “Language Coaching” had to present what the group was about and what was the skills we used and how they turned out. Thirty people attended this event, we had to display the same presentation 3 times, every group with 10 people. We recently saw that you were awarded a Certificate of Congressional Recognition for your participation in the art competition, “An Artistic Discovery” in Washington D.C. Could you tell us more about how you became involved in the competition and how you felt participating? I was awarded a Certificate of Congressional Recognition for my participation in an art competition, “An Artistic Discovery” on May 14th. I became involved because I received an email to participate by submitting an art piece. It was my first time competing with other artists with very good skills in arts. I felt happy and privileged to be part of that event and show my talent. Art is a way to communicate with the world about anything, art is never wrong. How have you felt KIND has helped you in learning about advocacy, writing your story and sharing it, and your art, with wider audiences? Since my participation in the 2017 KIND Gala, I have been feeling more open to who I am. KIND helped me see great potentials in myself that I never thought I had. Opening people’s eyes with our story is something only we can do, the ones that have gone through all of these experiences and having dreams for our future, showing people we matter and that we aren’t here to be stopped and cut off from whom we want to be. We need organizations like KIND, we need this sort of people that can support students and their families’ beliefs. We truly need to show that we are everywhere, we aren’t weak, we are needed.